Before: For several years I suffered difficult digestions. Even a small supper left me feeling heavy in my stomac, in spite of several visits to my doctor. Then, unconsciously, I had reduced the quantity of food I ate to limit these effects. Now: From the first cleanse I felt an improvement, the heavinesses in my stomach has now disappeared. Before : Tendency to be constipated, lazy bowel. Floating stools. Now: A marvel, my excrements sink. A sensation of well-being coming from my stomach, that I had never known before. NB: A blocked liver does not produce enough bile to decompose fats contained in food and floating stools is a clear diagnosis of this pathology. Before: Pain in the phalanxes, simply by flexing my little finger, the same went fot the others fingers. I also felt a pain if I pinched the articulation of my phalanxes with the thumb and the index of the other hand. Before: I would visit my doctor approximately twice a year, due to pain between my shoulder blades, a clamped cervical or a sciatica. My wife suffered from a very painful lumbago, which woke her at night, made her suffer in the morning and made her company throughout the day. The cause was clear on X-rays: very visible collapse of two lumbar vertebrae disks and storehouse of degenerative osteoarthritis. Having tried a lot of anti-inflammatory drugs with strong side effects and magic potions of all kinds, she came close to obeying to her doctor who recommended antidepressants and infiltrations. After the fourth liver cleanse her pains began to decrease. During the eighth cleanse a big ball of fat measuring 2cm in lengh and 12mm in diameter was evacuated and her pains continued to decrease. After 12 cleanses and more than 7000 evacuated balls of fat she does not have back pain anymore and does not take anymore medicine. Contrary to what seemed evident, her two lumbar vertebrae disks were not self-important enough to produce her pains. 1) Pushes away the internal organs, which justifies a small stomach on otherwise slim individuals. Despite exercises and diets, it is not ready to leave. 2) Blocks the running of the diaphragm, which prevents the lungs from filling completely. Now: No more difficulty to inspire fully. Before: The need to make regular use of anti-dandruff shampoos and the front hairs falling flat on the head. Here's the evolution, during a 20 year period, of my triglycerides and total cholesterol count. About every five years I do a full review as suggested by my health insurance center, so I have my blood tests for the years 1995 - 2000 - 2004 -. 2009 and 2014. It's clear that the decrease between 2009 and 2014 is due to the fact I was carrying out many liver cleanses. The increase, continuous for at least 15 years, was stopped and inversed without the intake of any kind of drug. 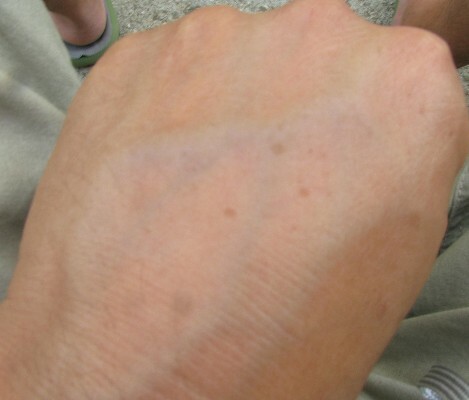 Before: For some years, spots of "old age" had appeared on my left hand and my right hand also began to be affected. I thought that it was because I was nearly 50 years old. Now: No more spots on my hands. In fact instead of "old age" spots they were just liver spots, which are only expressing a dysfunction of the liver. Some of them disappeared, and for the others, their pigmentation became so blurred that they are only visible up close. 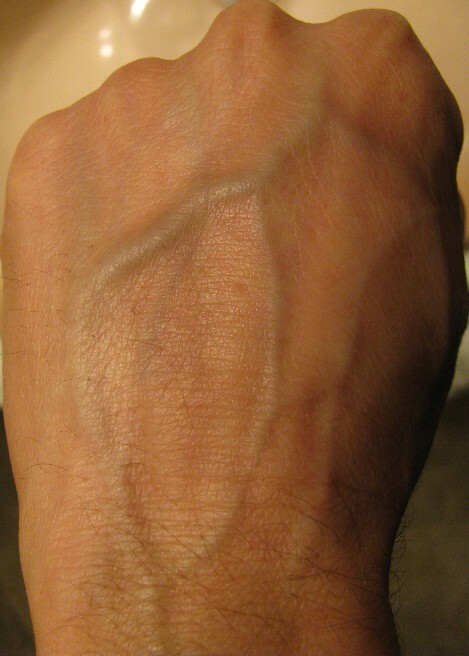 Below, two photos of my left hand. The first photo taken on 10/08/2010 before beginning the liver cleanses (the quality of this photo is not good) and the second taken on 26/02/2011. It's clear that the spots have disappeared. 1) A big gallstone could remain clamped in the route gallbladder/duodénum. I think this forced expulsion, combined with the bile ducts dilatation caused by magnesium sulfate, is much less risky than when the saturated gallbladder tries to eject the gallstones that is clogging the duct by itself, because in this case it is not helped by bile duct dilatation, neither by the power of the contraction caused by the high dose of olive oil ingested. In my case everything went well, and I have not found a single witness on the internet stating that fact. There is therefore no evidence for me to certify that fear. Especially because almost all of what we reject is fat from the liver and there is still some uncertainty about the form in which fat is expelled from the liver, see "Remarks on the conposition of my samples" on page analysis. It is one of the fears sometimes expressed in various forums. To check this point I asked a Swiss laboratory (OLIGOPHARM) to carry out an analysis of my hair in February and September, 2011. The hair analysis helps measure which minerals and trace elements are present in the body. I was thus able to measure in 7 months of interval the impact of liver cleanses on 19 minerals and trace elements (Calcium, Zinc, Phosphorus, Sodium, Potassium, Magnesium, Silicon, Copper, Iron, Selenium, Nickel, Molybdenum, Silver, Gold, Cobalt, Chromium, Lithium, Manganese and Vanadium) as well as on 7 toxic elements (Aluminum, Arsenic, Barium, Lead, Mercury, Beryllium and Cadmium). - Fewer distances in the standard, 7 sections in February and 5 in September. - Fewer distances in ratios, thus a better global balance. - A decline for 11 on 19 of the tested elements. - An increase of the Barium, which I suspect comes from my wife's hair dye. On the whole it is not a disaster, even if my values are rather close to the low level of the standard, but it's maybe normal because I am small. I must specify that I consume a rather healthy diet: I insist on fruits and vegetables, bio when possible and I limit meat and precooked meals. 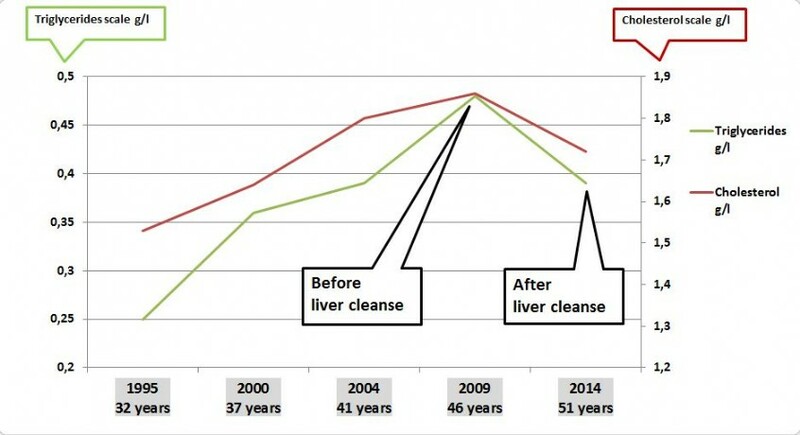 Maybe these 16 liver cleanses would have had a decline impact on tested elements more importantly on a regular eater of processed food. We are all made the same way and this purging technique acts mechanically the same way on each individual. Everyone can reap the benefits that come with a liver that removes its waste. There is no mystery here, no magic, but unfortunately no miracle with the gallbladder: I have as yet no evidence, confirmed by ultrasound, of gallstones more than a few millimeters that have been removed from the gallbladder. For the gallbladder this method is primarily preventative. Purging it regularly when it is still healthy will prevent the formation of gallstones and their fatal result, because the amputation of the gallbladder (which is a term a little less muffled than ablation) is not so trivial, it's enough to read on the forums the stories of those who had to learn to live without one. Cleansing the liver and intestines is no doubt one of most important things to do to improve one's health, and the more time that goes by the more I am enthusiastic and stunned by the benefits I obtained, but a great deal of rigor is needed. Even if all this is simple, it is necessary to hang on if we want to do 10 or 15 liver cleanses, because between the fast, the mixture to be swallowed, the bad nights, the nausea and the sessions on the throne, honestly it is not a picnic. Fortunately it is only a day a month during 6 to 12 months on average, to win an OLYMPIC SHAPE !!!!!!!!!!!!!!! At the date of the information message (the small envelope that stirs at the top right of the screen) I'm still alive and none of the symptoms I got of rid has returned.